The St. Louis Cardinals have some work on their hands this offseason to get back to the postseason for 2010. Question mark roster spots are found all over the ball field. 1. Starting Pitching: The Cardinals have three big name pitchers signed to long term deals for the coming years; Chris Carpenter, Adam Wainwright and Kyle Lohse. Carpenter and Wainwright are both coming off the 2009 season as Cy Young Candidates. Kyle Lohse on the other hand was plagued this season by injury. With the rotation rounding out fairly strong in the one through three holes, look for the Cardinals to possibly add depth this offseason. Some potential suitors can come from the free agent market in players such as John Smoltz, John Garland, Justin Duchscherer, Brad Penny, or Joel Pinerio. 2. 2. The Bullpen: Overall the Cardinals were happy with the 2009 bullpen. Ryan Franklin found a spot as the Cardinals closer with a 1.98 ERA and 38 saves. Blake Hawksworth and Kyle McClellan jumped on the scene as strong right-handed throwers as the two combined for 17 holds. As for the lefties, manager Tony LaRussa threw the combination of Trever Miller and Dennys Reyes. The two lefties combined for 31 holds and 79 strikeouts. Although posting these kinds of numbers, the Cardinals can still use some help in the pen. 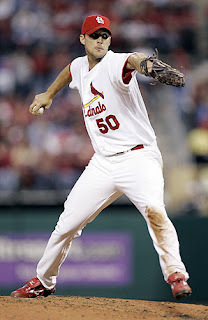 Look for the Cardinals to build their bullpen from within the organization for 2010 with a hurler like Mitchell Boggs. 3. 3. Infield: The Cardinals are locked up at the positions of the infield except for the hot corner. At first is still going to be Albert Pujols, second is Skip Schumaker and at short is Brendan Ryan. As the 2009 season opened up, no one expected the middle infield to be as solid as they were. Schumaker was making the transition from the outfield to second base, and Khalil Greene was signed on as the shortstop. With Greene going down for anxiety issues, the Cardinals found a successful player from within in Brendan Ryan. Ryan played gold glove caliber short registering only nine errors and combining in 80 double plays. Playing in the utility roll up the middle for the 2010 season will be Julio Lugo, from the Chris Duncan trade. Getting over the hot corner. Tony LaRussa used many different players at third base, from Brian Barden to Troy Glaus and Joe Thurston. It was not until the Cardinals landed Mark DeRosa in a trade where the found success. Unfortunately, DeRosa has become a free agent this off-season. Now the question is to you resign DeRosa and let outfielder Matt Holliday walk, or sign Holliday and let DeRosa go? Look at it this way Holliday is younger than DeRosa and the Cardinals already have a successor at third base in youngster David Freese. Look for DeRosa to walk and Freese to fill the roll. 4. 4. Outfield: The biggest question here is Matt Holliday. Holliday added a lot of power to the Cardinals in filling the fourth spot in the batting order. He provides protection for Pujols and can hit for a high average. The problem here is his agent is the always-promising moneymaker in Scott Boras. Boras is going to do whatever it takes to get Holliday the money this offseason. Cardinals GM, John Mozeliak may not be up to the taking on this. If Holliday walks there are plenty of other free agent suitors; Jason Bay, Jermaine Dye and Xavier Nady. Mozeliak and the Cards will find someone to fill that roll. As for center and right field those two positions are locked up by rookie Colby Rasmus (center) and Ryan Ludwick (left). Rasmus came off a solid rookie campaign hitting 16 homeruns and 52 RBI’s. 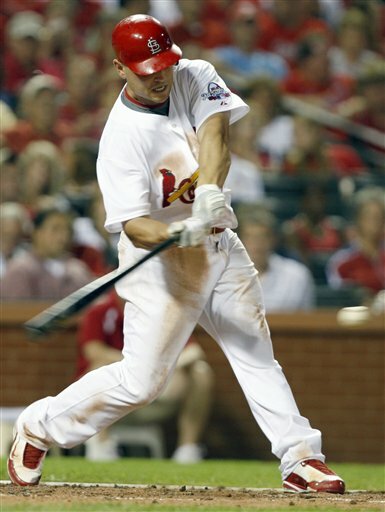 Ryan Ludwick continued to produce for the Cardinals hitting 22 homeruns and 97 RBI’s.